I’ve seen several attempts using a mobile device such as a tablet or smartphone as a desktop, such as using the Galaxy Nexus with an HDMI monitor via MHL, and Canonical’s Ubuntu for Phones and Tablets. The first solution runs Android, an operating systems not (yet) really suitable for desktop use, and Canonical solutions are still work in progress. But the recent video demonstration shown by Bernie Thompson, Plugable Technologies’ founder, with a Dell Venue 8 Pro tablet (about $300) powered by Intel Atom Z3740D “Bay Trail” processor and running Windows 8.1, is the first one which seems actually usable for most desktop uses, baring high-end gaming, or other tasks where the quad core Intel Atom processor may not provide enough processing power. The full setup works as follows. The Dell tablet is connected to a universal USB 3.0 docking station (UD-3000) via a micro USB OTG cable. The docking station used also provides a Gigabit Ethernet port, a DVI/VGA monitor port, and USB 3.0 and 2.0 ports. USB 3.0 to VGA graphics adapters are connected to the docking station, in order to be able to 4 VGA displays. 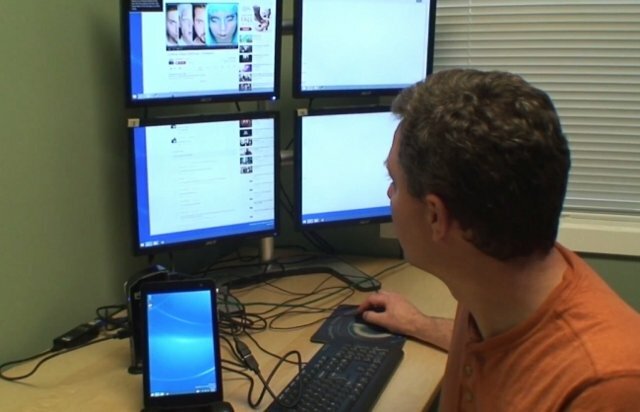 Once the tablet is connected to the dock station, drivers are installed automatically in the tablet like any PC, and after about a minute, Windows 8.1 shows up on the four monitors. Everything looks really great, with the 4 monitors acting as one display, where you can drag and open windows to any of the displays. Once you done, you can just disconnect to microUSB OTG cable, and use the device as a normal tablet. However, there’s at least one downside to this setup: the tablet’s USB port will switch to host mode, meaning you can’t charge the device while it’s connected to the docking station. That also means you’d better make sure you’re using a powered USB hub or docking station, or you’d quickly drain the battery. Via UMPC Portal and Liliputing.